I’ve been thinking about which were my favorite varities this year. 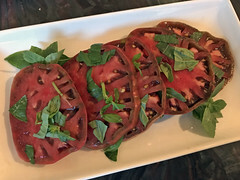 For slicing tomatoes, it was an heirloom variety called True Black Brandywine (seeds from Baker Creek). It’s not related to Brandywine and doesn't have that mealy flesh. Its flavor and texture are fantastic and it's beautifully colored - deep purple with green shoulders. My best sauce tomatoes were San Marzano and Opalka. San Marzano gave me a huge number of middle sized tomatoes. Opalka had fewer tomatoes but they were enormous and perfect for sauce. I grew about 20 varieties this year - a couple of each. Next year I'm planning to grow many fewer varieties. Probably slicing tomatoes: True Black Brandywine, Orange Blossom, Pink Beauty, Cherokee Purple, and Mortgage Lifter. Sauce tomatoes: San Marzano and Opalka. I'd love to hear what tomatoes did best for other gardeners. Coastal northwest is not ideal for tomatoes, very cool nights, so cherry tomatoes are the ones that preform the best and sun gold is at the top of the list. Principe Borghese- OP Italian small plum, very prolific, great for drying and sauce. The seed companies describe it as determinate but that is not my experience. Mary's small OP plums- seeds I saved from my mom who is now passed. She planted these every year for what seemed like forever. Sweet, prolific and great for sauce or drying. Sounds great. I'll try the first two, disease resistant and high productivity sounds good. Maybe the third one too. 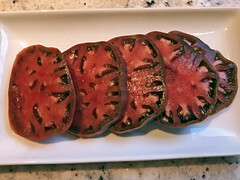 I think Black Brandywine is an excellent tomato as well, it's actually one of the earliest of the big tomatoes for me, although I used a different seed seller. 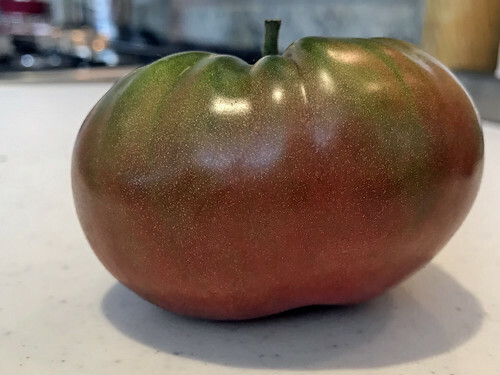 Granny Cantrell's German Red - large pink, early and productive for a big tomato, a shorter plant than most I grow and difficult to germinate at times. These were from Baker Creek. I grow 4 different varieties of Brandywines and I do think the Pink/Red Brandywines require hot humid summers to reach their potential. Awesome! Sounds Ike I be growing lots of varieties again. I can’t resist trying some of these. I live in the northern Adirondack Mts. This season I grew Amish Romas (I bought a bushel from the Amish a few years ago, so I'm unsure of their true name) and Italian Heirloom tomatoes. Even with our wet summer, I had tomatoes over a pound each! I tried Mortgage Lifters and Brandywine this year and both were a flop. I may try again next year.